Last year I posted a blog expressing my disappointment with what had once been my favorite horror/gore magazine (a post you can check out HERE). Over the last few years, the iconic FANGORIA seemed to go from subversive pleasure to mainstream “sell out.” Disillusioned readers (such as myself) began flocking to newer alternatives such as Horrorhound and Rue Morgue (Horrorhound becoming my new favorite). My devotion to FANGORIA was such that this did not come without a certain level of “guilt.” In fact, I held on to the magazine long after most of my fellow horror friends had given up. As stated in the aforementioned article, I allowed my subscription to expire and assumed (as I walked away cold turkey) that it would be a long time before I’d ever open another issue. Earlier this year, while visiting my local comic/magazine shop, my eyes were immediately drawn to their newest issue featuring Gene Simmons on the cover. I soon found myself holding it in my hands while sending out cell phone pictures to all of my KISS/horror friends. Soon my phone was “abuzz” with return texts saying “wow!” “cool!” and “Can you get me one?” I grabbed the last three copies and headed towards the check-out. …you’d have seen em’ all! This Gene Simmons visage, while technically not an exception, was different in that it was a painted cover more reminiscent of the old Famous Monsters of Filmland covers than the previous year of FANGORIA. Aside from that, a Gene Simmons painting without blood on his mouth would be a poor depiction indeed! Better still, this issue would also boast a “fold out poster” of the cover – a bonus feature that had been missing from FANGORIA for some time. While Simmons is still going strong (touring with KISS and appearing in his reality show, “Gene Simmons Family Jewels”) the very sight of his younger face clad in full make-up does carry with it a great deal of nostalgia. And those warm fuzzy feelings of a bygone era was one thing that had been missing from the pages of Fango for some time. 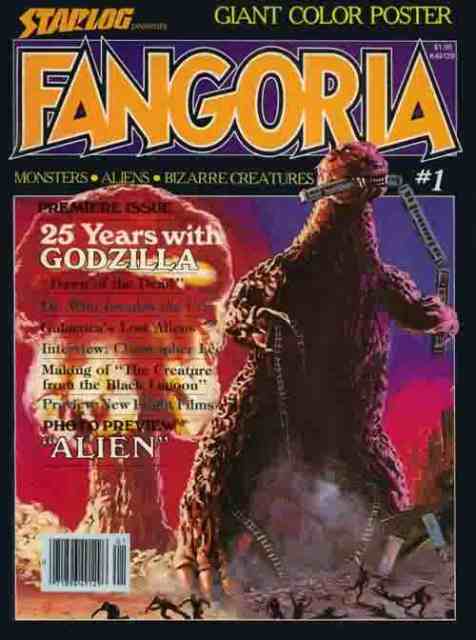 Lets not forget that when the magazine premiered in 1979, it was the original Godzilla (1954 GOJIRA) that graced its cover. Of course fans also want to know what’s new in the horror realm and what movies are “coming soon.” I never had a problem with FANGORIA keeping me updated on the newest horror films slated for release (in fact, I relied on it) and certainly understand that part of being “Number 1” requires that you appeal to a wider/younger audience. But this should not be done at the cost of your core fans who want ALL that horror has to offer – past and present! 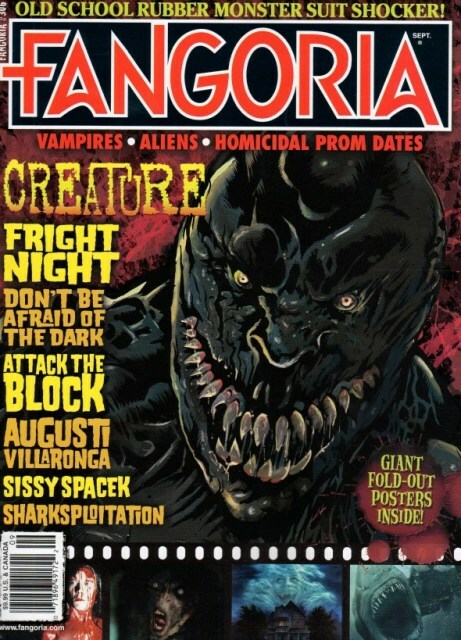 FANGORIA does best when it incorporates the best of both worlds. To my delight, the inside of FANGORIA #298 was as appealing as the outside and the issues that would follow (yes, I was officially “off” the wagon buying all subsequent issues) seemed to get better and better. I am happy to report that I am, once again, a Fango subscriber! But this begs the question; what happened to cause such a dramatic shift? The answer is a good, old-fashioned “changing of the guard.” The previous editors had been ousted and a whole new team was brought in, demonstrative of how many other fans must have joined the recent exodus. In recent issue of FANGORIA (#305), I got the distinct impression that this wasn’t without some degree of hard feelings. Former Fango editorial assistant, Shane Tea French, writes in the letters section…. Let the professionals duke it out, as a fan I am VERY pleased with the magazine’s direction and hope the imaginative covers will continue. I urge all former readers who may have left in the last few years to give “America’s Horror Magazine” another try. There are some relationships in this world that are worth patching up despite experience seeing some rocky times. This entry was posted in Misc Mayhem and tagged Fangoria, GENE SIMMONS, Horrorhound, RUE MORGUE, Tom Savini. Bookmark the permalink. ← KILLER SHARK Fans Beware! THE REEF will make your JAWS drop! One of my favorite mags at one time as well. you wrapped up the article circle jerking!!! DAVE!!! That is gross! Just say you like the magizine! Yeesh! Shaun!!! You just broke our rhythm! Dave! What a great feature! Thanks man! You’re welcome, Chris! We appreciate the comment and, of course, all the great work you’ve done! Good article Dave. I am contacted by Fango from time to time on advertising deals for my films and will consider taking them up on it in the future.